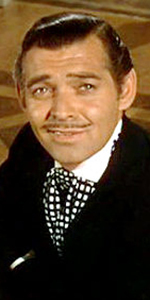 Clark Gable as Rhett Butler in Gone with the Wind, released in December, 1939. 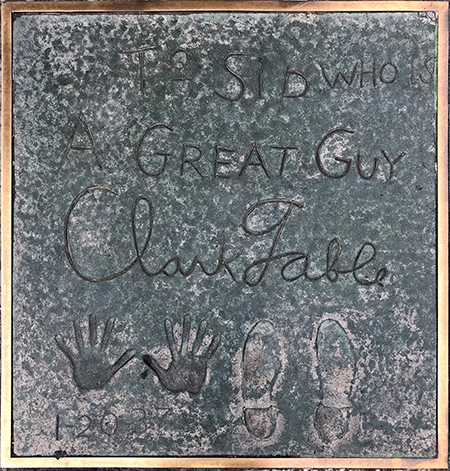 A you have to do is to say "Clark Gable" and most people understand: you are talking about the most famous film star during Hollywood's Golden Age. After a smashing beginning, Gable was cast as Rhett Butler in Gone with the Wind (released in December, 1939) by popular demand. It remains his most famous role. Clark Gable's mother died when he was 10 months old, so it was his stepmother who encouraged the young man to play musical instruments and to learn to recite. Meanwhile, it was his father William who insisted the lad learn the manly arts and the value of hard work. When Clark was old enough, he went to work in the Firestone Tire factory in Akron. But the theatrical life was calling. Gable rattled around the country in stock companies, and odd jobs. Encouraged by actress Laura Hope Crews to persue acting, Gable fell in with actress Josephine Dillion, who gave Gable his training in acting. In 1924, the couple married and struck out for Hollywood. Gable found extra work, but could find nothing meatier, so he and Josephine had him join the Laskin Brothers Stock Company in Houston, where he furthered his stage craft. Gable debuted on Broadway in the play Machinal in late 1928. While doing two more leads in Broadway plays, Gable was befriended by actor Lionel Barrymore, who taught the young man much. They starred in several films together later. After divorcing Dillion, Gable attempted Hollywood again, where he was signed by Metro-Goldwyn-Mayer. His breakout performance was in A Free Soul (which played the Chinese in June, 1931), co-starring with his mentor, Lionel Barrymore and Norma Shearer. When Shearer wanted to make a film of Strange Interlude (which played the Chinese in July, 1932), she chose Gable to play opposite her. After that, Gable was starred alongside all of the M-G-M stars, but it was on a loanout to Columbia for Frank Capra's It Happened One Night (released in February, 1935) with Claudette Colbert which made him a superstar and Best Actror Oscar-winner. Gable was put onto the fast track: Manhattan Melodrama (released in May, 1934), Forsaking All Others (which played the Chinese in January, 1935), Mutiny on the Bounty (played the Chinese in November, 1935), San Francisco (played the Chinese in June, 1936), and Test Pilot (played the Chinese in April, 1938). In early 1937, Gable had just finished starring with Joan Crawford in the comedy Love on the Run for director W.S. Van Dyke. The picture had its opening at the Chinese on Wednesday, January 20, 1937, and to celebrate, they had Gable and Van Dyke out to make their impressions. With Gable, the largest crowd up to that time had gathered to watch the ceremony (surpassing even those estimates for Shirley Temple in 1935). After that, Gable's career went to the top: Gone with the Wind (Released in December, 1939, but didn't play the Chinese until a 70mm re-issue in December, 1975). The role challeged him, and he came through with flying colors. During filming, he was married to actress Carole Lombard; the couple set up shop on Raoul Walsh's old ranch in Encino. But in early 1942, on a Bond selling flight, Lombard was killed when her plane crashed. Devistated, Gable joined the Army Air Force, where he became a second lieutenant, started shooting a war documentary, and flew five combat missions over Germany in a B-17. Narrowly avoiding being killed during one raid, Gable was shipped back to Hollywood, where he completed his film, Combat America (released in 1943), and was discharged in mid-1944. Post-war Gable was kept busy: The Hucksters (released in August, 1947, To Please a Lady (released in October, 1950), Mogambo (released in October, 1953); Gable became an independent player in 1953, and he was still able to bring 'em in with pictures like: The Tall Men (which played the Chinese in September, 1955), Run Silent, Run Deep (released in March, 1958), Teacher's Pet (released in April, 1958) and It Started in Naples (released in August, 1960). Gable's last film was The Misfits (released in February, 1961), which was given a special screening at the first Filmex, held at the Chinese in November, 1971. In early November 1960, Gable was hospitalized after suffering a heart attack. He died of a blood clot ten days later at the age of 59. Grauman's Chinese Theatre, Hollywood, California. W.S. Van Dyke / Clark Gable Forecourt ceremony, Wednesday, January 20, 1937. Sid Grauman and director W.S. 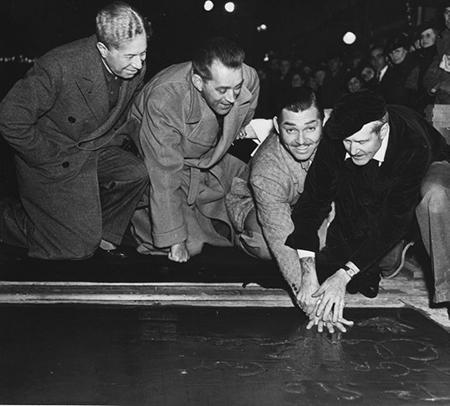 Van Dyke look on, as, Clark Gable has his hand imprinted by cement artist Jean Klossner.